Latin America presented its own recipes for development in the new era of relations with the United States in the Seventh Summit of the Americas, where Cuba took part for the first time and the U.S. said it would close the chapter of “medd[ling] with impunity” in its neighbours to the south. The reform process launched in Cuba by the government of President Raúl Castro has made several changes to the country’s rigid social and economic structure, with the ultimate aim of bringing this island nation out of its economic lethargy and making production, which is sinking under the weight of restrictions, controls and contradictions, more efficient. The Cuban National Assembly, the parliament, has just passed a historic milestone: the visible turning point when one momentous and complex phase in the life of the country begins to come to a close, and a door opens on a future that, however hard to predict, will in many ways be different. The new faces in key positions in parliament and other branches of the Cuban state will need to prove their charisma and potential political leadership, possibly in a more participative way, in the context of current economic and social changes, analysts say. 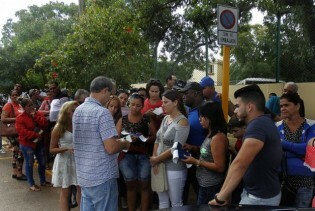 Early this month, Cubans went to the polls to elect delegates nominated by municipal and provincial assemblies to the island's parliament, the highest government body where citizens' votes carry decisive weight. The turnout, as usual, was over 90 percent, and all the municipal candidates, as usual, were voted in. Among millions of people flocking to the polls in Cuba to vote in general elections was the unexpected figure of former president Fidel Castro, making a surprise public appearance in what was interpreted as a reaffirmation of his support for the government of his brother, President Raúl Castro. Rules allowing Cubans to buy and sell cars and homes, and now, to take out loans, are two of the latest steps taken to "modernise" the economy.